Mistletoe grows wild in many parts of Europe and North America. It is a parasitic plant that draws the host tree’s carbohydrates into itself. This activity can reduce the health of the particular branch to which the mistletoe is attached and minimize fruit yield. Orchard owners know how to get rid of mistletoe in order to increase crop production. Controlling mistletoe plants is extremely important in areas like northern California where the plant is a pest and colonizes production orchards. Mistletoe in trees steals nutrients and water from the host tree. The little shrub-like plant sends out root type organs, called haustoria, into the cambium of the tree and pirates the tree’s carbohydrate and moisture sources. Overall, this doesn’t harm the tree a great deal unless there are many mistletoe plants on it. However, it can reduce the production of the tree since some of its resources are impacted. Orchard situations are especially sensitive to the presence of the parasite. It is easy to kill mistletoe growth, but the roots can be persistent and the plant may simply spring back. Simply cutting back the twigs and leaves will not kill mistletoe. You need to actively kill the roots and, therefore, the entire plant. A non-toxic way to remove mistletoe is to simply prune it out. In order to prevent harm to the tree, you may want to use the services of a certified arborist. They know best how to remove large pieces of wood without adversely affecting the tree’s health. 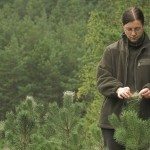 If you do the pruning yourself, remove infested material back to the branch collar. To kill mistletoe growth permanently, cut back the leaves and stems to the wood and then wrap the area with wide black polyethylene to block light and prevent it from re-sprouting. Consistently cutting out the growth will not kill the plant but will prevent it from flowering and fruiting, creating seeds that will spread the mistletoe. Controlling mistletoe with chemicals should be done by a professional and only in instances where other methods are not practical. Spring spraying of the growth regulator ethephon has been shown to have some effect. The leaves of the mistletoe must be completely wet and the process needs to be done before the host tree has leafed out. Temperatures should be around 65 F. (18 C.). This is really more of a bandage on a booboo. Only some of the mistletoe will fall off, but the plant will slowly grow more. 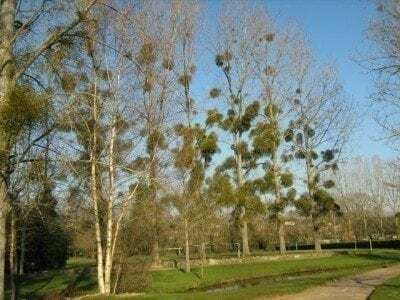 Trees are able to withstand most mistletoe infestations, so removal is not absolutely necessary. Promote good health in the tree by giving it plenty of supplemental water and fertilizing in spring.